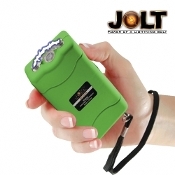 With Jolt's new 20 Million Volt Stun Gun, you'll be holding the power of a lightning bolt in the palm of your hand! It is one of the smallest, yet most powerful, stun guns that you can buy. It is only 4" x 2.25" (about the size of a cigarette pack) and delivers a whopping output of 20,000,000 volts via Jolt's Triple Stun Technology. Good enough to knock down almost anybody (if the sight and sound alone don't make them run)! No need to worry about loosing the charging cord because this unit has a built-in charger that plugs directly into a standard wall socket. Leave it plugged in overnight, and grab it as you leave in the morning for protection all day. The bright LED flashlight can be operated independently of the stun gun, so you're never without a light in an emergency. Includes a disable pin that renders the unit inoperable if it is taken from your hand. The rubberized armor coating protects the unit and ensures a firm grip. The included free nylon belt case makes it perfect for someone who likes to carry something to protect themselves anywhere and anytime!